Joana Starnes is one of those authors whose new releases I’m always impatient to read, so it is no surprise that I could not resist to read Miss Darcy’s Companion nonstop shortly after its release date, and guess what? I loved it! But of course, that is also no surprise as Mrs. Starnes has become one of those authors whose books I always love to read. In this variation Mr. Bennet dies and Mr. Collins loses no time in sending his cousins to the hedgerows. Or that is where they would have been were it not for their uncles assistance and Elizabeth’s resilient character. Being thrown out of her house, Elizabeth seeks employment as a governess and her employer is none other than Col. Fitzwilliam’s sister in law, Lady Stretton. This is the point where the book starts and we soon realize that Lady Stretton is a snobbish, insupportable person who treats others as inferior beings. So, it comes as no surprise that when Georgiana Darcy requests her guardians to hire Miss Bennet as her companion instead of Mrs. Younge, and they acquiesce, Elizabeth finds herself in the position of Miss Darcy’s Companion. Joana Starnes starts this book by teasing us! She places Elizabeth and Mr. Darcy in the same house, in close proximity, and we spend the entire first chapter eagerly waiting for them to meet, but that pleasure is delayed, and we only see them together when the position as Miss Darcy’s Companion is proposed to her. From there, the book continues with a structure that I personally like very much. The first chapters will focus on the day to day activities at Pemberley and the interactions between all characters. The authors knowledge of all things regency is transmitted in these first chapters, and it is also during this first part of the book that we, as readers, get to know the characters and that they get to know each other. We are given the pleasure to see Elizabeth falling in love with Mr. Darcy by getting to know his true character, we see her pining for him (yes, yes, yes), and we see Mr. Darcy unknowingly falling in love with Elizabeth. After this pleasurable peaceful time, the twists and angst appear. And even though this is a lighter book compared to others Mrs. Starnes has written before, we do have action, suspense, fear and angst, or this would not be a Joana Starnes book. I could point out numerous scenes I loved in the book, but what I loved the most about it was Mr. Darcy. The character remained true to the original, and Joana Starnes created what I call the perfect imperfect Darcy! He was still proud, stern and firm, yet charming all the same. He was portrayed in this book exactly as I imagine Mr. Darcy to be, and that is something that doesn’t occur that frequently. I loved Mr. Darcy’s reactions towards unpleasant situations and his attitudes. The entire scene after he sees Elizabeth leaving the inn was just heart breaking. The carriage ride that follows was one of those scenes that pulled me into the book and made me read fervently! There was so much emotion present in that scene, his jealousy and anger so adoringly painful, that I knew I was reading a Joana Starnes book. Scenes like this are the reason I still love reading JAFF and they are a boost to my addiction and love for Mr. Darcy. Another detail that I enjoyed in this book were the letters from Mr. Wickham and Miss Bingley. They were clearly an added value, and it was interesting to see how Mr. Wickham applied to the Kympton Parsonage after having accepted the money instead of it. This is something we rarely see in JAFF novels, and Mrs. Starnes did a beautiful job in including it through a letter. There wasn’t anything I disliked in this book, and I would only add a few more self-conscious scenes between Mr. Darcy and Elizabeth to make it absolutely perfect. As always, Mrs. Starnes has wrote a book that cannot be missed by any JAFF reader! If you haven’t read this book yet, I highly recommend it. As a sign of appreciation for her readers, Mrs. Starnes would like to offer a copy of Miss Darcy’s Companion to one of lucky winner. The giveaway is international and is open until the 9th of June, all you have to do is comment this post and share your opinion with all of us. I like the idea that we get to see Lizzy pining after Darcy in this variation. Can’t wait to read this! Thanks for coming over to read Rita’s wonderful review and best of luck in the giveaway! This book looks great! Love the cover and would love to read this. It is interesting to see the many twists on these books. Love it. Thanks, Sonja, I’m so glad you found the cover and the premise tempting! As for the twists, we’re never getting bored of spinning P & P in every possible direction! Hope you won’t get bored of it either 🙂 All the best and thanks for stopping by. Love Joana’s books! Can’t wait to read this one! Wonderful to hear that, Dung! Good luck and I hope you’ll like it. Love all of Joana Starnes’ books! The premise of this sounds really intriguing. It’s definitely on my to-be-read list. Thanks for the opportunity to win it in this giveaway. Thanks ever so much for the lovely comment, Debbie! I’m so glad you liked my other books and that you found this premise intriguing. Best of luck in the giveaway, fingers crossed and I hope you’ll like MDC too. Slimy as they both are 😀 Thanks, Vesper, and good luck! What a lovely review! And how could we not want more scenes between D&E? That’s always what I want, right?? Lol!! I’m just thrilled Joana followed her decision to torture E and that she’ll do it again really soon. Lucky us! Maybe Team Darcy shirts are in order, because as much as I love Elizabeth, I’d want to bring Darcy on a deserted island with me any day of the week? Thanks ever so much, Claudine, but hats off to you and Rita, it was you lovely ladies who made me see that Elizabeth deserves her fair share. I’ll definitely do it again soon, it’s rather fun (as I was saying, there must be something Freudian in there somewhere 🙂 ). And yay for ‘Team Darcy’, I’d happily go for the club badge, team shirts, bonnets, anything. Been following Joana’s book tour. Excited to read your new book and thanks for the giveaway! Thanks for following the tour, Priscilla, I’m so glad Miss Darcy’s Companion caught your eye! Good luck and I hope you’ll like it. That’s so kind, Patricia, thanks! All the best and thanks for stopping by. Lovely review! I am looking forward to reading this book and appreciate the chance at the giveaway! Thank you! The cover of this book is just delightful! Joana never disappoints! Over the moon that you like the cover and the premise, and thanks for the ever so kind words & vote of confidence, much appreciated!! Best of luck in the giveaway and I hope you’ll like the story. No need to include me in the giveaway as I’m in the happy position of having read this book!! My review is posted on GR but needless to say,I loved it!! The bar is set extremely high when we begin one of Joana’s tales. We expect to be troubled,angered,concerned and worried about how ODC will resolve whatever situation they’ve found themselves in,amid the myriad misunderstandings and crossed wires that it seems,is their fate to labour under!! And this book was,of course,no exception. Joan’s has a beautiful way with words,and I truly believe she is gifted in how she relates and portrays her story. My favourite lines were those penned describing how the ivy grows on the wall,the tendrils slowly taking hold,and before the keen observer has realised,it has covered the entire wall……… Her use of these words to convey a certain person’s feelings were just so beautifully phrased,I re read that particular several times……..sigh!!! Hope whoever wins this book will enjoy it as much as I did. A great review,Rita. I’m delighted that you loved it too!! I can’t thank you enough, Mary, for the wonderful review at Goodreads, it was amazing! 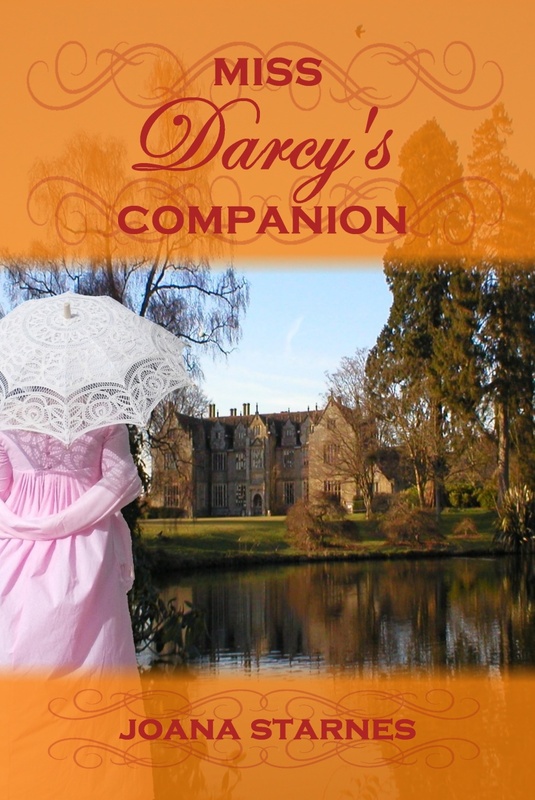 I’m ever so happy that you liked Miss Darcy’s Companion and huge thanks for the lovely words about my books. LOL, ODC really can’t get a moment’s peace with all the crossed wires, villains, missed chances and whatever other form of misery we dream up for them. Fingers crossed JAFF will live on, I really can’t imagine what I’d read without it!! Thanks again for your wonderful words, they mean so much to me! Wonderful review. Very excited about this variation. Thank you for the giveaway. A pleasure, Becky! Thanks for taking part in the giveaway. Best of luck and I hope you’ll like it. Excited for this book – thank you for letting me know about it!!! Thanks for coming over to read Rita’s wonderful review and take part in the giveaway. Best of luck! Excited for this new take on the story! Wonderful to hear that, many thanks! Hope you’ll like it. Now, that was a lovely and satisfying review, but also an excellent promise that I’ll be getting a special treat when I read this one. Thanks, Rita! It really was a wonderful review, Sophia Rose 🙂 Thanks ever so much, Rita, and thanks Sophia Rose for visiting and reading it. Hope you’ll like Miss Darcy’s Companion. Best wishes! Great to hear that, Kristen! Many thanks and best of luck. “There wasn’t anything I disliked in this book” – that is quite an endorsement! Not surprised though. Joana’s books are always good. I need to get my hands on this thing and soon! Thanks for the great review. Thanks, Ginna, for the lovely comment and Rita for the great endorsement! Best of luck in the giveaway, Ginna, and hope you’ll like it! I’ve just finished reading 2 of Joanna’s other wonderful books. Can’t wait to read this one! So happy to hear you liked them, Ann! Hope you’ll enjoy this one too. Many thanks for the lovely comment and good luck! I read this and loved it. All of Joana’s books have been 5 stars for me! Huge thanks for the kind words and all the support, Sheila, much appreciated! All the best! Alright. I NEED to read this book! 😀 Thanks for the giveaway! A pleasure,Maria 🙂 Hope you get to read it soon and that you’ll like it! Good luck and thanks for putting your name in the hat! Thank you for the review Rita! Wonderful to hear that, Marta, and I hope you’ll like it. Good luck in the giveaway! Quite similarly to Rita, I have a soft spot for Mrs. Starnes’ books, to be honest. My first ever JAFF book was written by her and I liked it so much, the writing, the character development, the pace and feel of everything. Will definitely have a read of this one too, since I am quite fond of Georgiana en a peek at Pemberley’s day-to-day life is enticing to a curious soul as myself! Much sucess, Mrs. Starnes! My to-read/buy list is filled with your titles! Thanks ever so much for the lovely comment, I’m over the moon that you like my style and my books! If you’re fond of Georgiana I hope you’ll like how she grows and matures in this variation, where she’s not under Mrs Younge’s nasty influence, but Elizabeth’s. LOL Oh yes, I think we’re all very curious souls where it comes for life at Pemberley. Loved that! Best of luck in the giveaway and thanks for taking part! Good writing, interesting twists on a classic – the best of Fan Fiction: Jane Austen is here, at From Pemberley to Milton! Many thanks for reblogging this at Lepidopterae, that’s so kind! All the best! This sounds like a very interesting variation. I love her pink dress on the cover 🙂 . Thanks for offering the giveaway! So glad you like the premise! The dress is really lovely, as is the lady wearing it 🙂 Thanks for taking part in the giveaway and good luck! This is a very interesting twist. I hope I get lucky! I hope so too, tgruy 🙂 Good luck and hope you’ll like the full story. I do want to read this! The opening plot twist is not something you see often. Thanks for stopping by to read the excerpt, June, I’m so glad you liked it! Best of luck and thanks for taking part in the giveaway.